During a CSU Board of Trustees (BOT) meeting on March 22, the final matter on the agenda was the vote on tuition increase, a discussion that lasted almost three hours. The tuition increase will raise undergraduate tuition by $270, graduate tuition by $438 and several certificates, doctoral and international, tuition by several hundred dollars. The board made an amendment to the proposal before voting that will rescind the tuition increase if the state matches the $77.5 million the tuition increase would generate for the CSU. Chair of the finance committee trustee Peter J. Taylor, understood the difficulties facing the CSU system and its students because of lack of state funding, but said the resources to provide help and support need to be funded in some way. Former CSUN Associated Students (A.S.) President Jorge Reyes, who is on the California State Student Association board as V.P. of University Affairs, began to get emotional as he shared how he maintained a full-time job to help pay for his own education and help his family. “How can we ask for a tuition increase when students are struggling to pay for food, have housing insecurities and students with mental illnesses must wait three to four weeks to have their first appointments [with counselors] on their campuses,” Reyes said. Many CSU trustees suggested waiting to hold a meeting until May to reconvene about the tuition increase. There was back and forth by several members about the responsibility of fulfilling the pending $168 million CSU budget deficit that should be in the hands in the state’s legislator. Students, faculty and several members of the board insisted that the Board of Trustees vote no on the proposal to place pressure on the state legislature to rethink their budget cuts to the CSU. 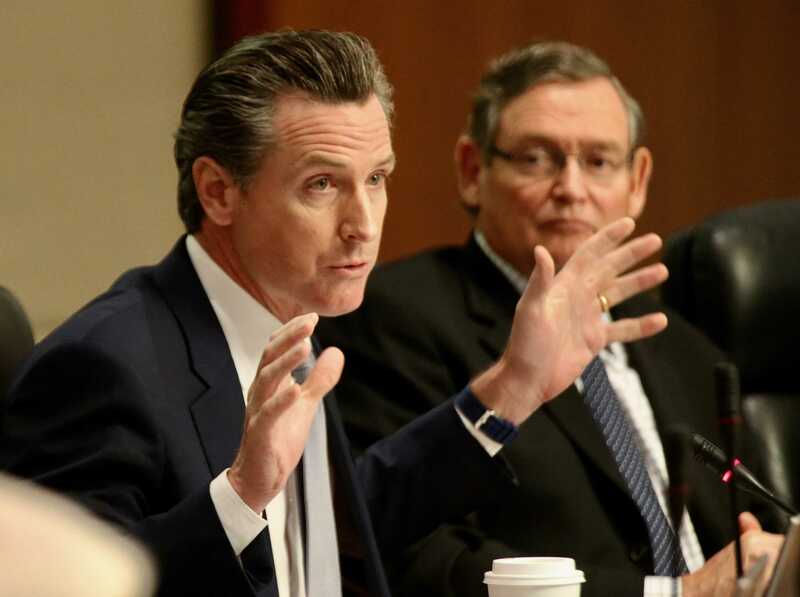 Lieutenant Governor of California Gavin Newsom, who attended the meeting, suggested holding the state accountable after hearing student’s stories and waiting until May to decide on an increase. He said the board holds emergency meetings all the time and that denying the increase would put pressure on the state. “We need the money, boy do we need the money, and we need to advocate for the money. This is the best approach to advocacy. Say no to the tuition increase today,” Newsom said. Students who attended the meeting were dressed in cap and gowns with price tags around their necks with the word debt written in black letters. There were also students, including Reyes, who wore red shirts with #ChooseCSU across their chests in support of the movement for students to choose CSUs and for the state and BOT to support students in the CSU. Faculty and staff were also in attendance from several CSU campuses who addressed the tuition increase. Staff said if students were not able to go to school, they lose the people that they are hired to support. Faculty shared stories of their students who work multiple jobs to pay for their tuition and other expenses. A professor from Cal State Long Beach said many of his students have started working more in case their immigrant parents are deported and they must also support their younger siblings. The BOT met in January to discuss the tuition increase for the 2017-2018, but had warned campuses prior to putting into the agenda. CSUN A.S. President Sevag Alexanian released a letter to the university in December 2016 which stated the potential financial increase and the efforts A.S. would be make to help fight the increase.